Luxury residential and hospitality property developer Seven Tides has launched a five-year payment plan for its Anantara The Palm Dubai Residences in Dubai, UAE. Potential buyers can purchase ready-to-move-in properties with a deposit of 20 per cent of the total price. A further five per cent would be paid every quarter thereafter, starting 12 months from the date of the initial reservation agreement. Of the 449 units, there are now only 160 left which consist of one- and two- bedroom apartments. The one-bedroom apartments range in size from 1,156 sq ft to 1,560 sq ft and start at Dh2.73 million ($743,000); while two-bedroom apartments range from 1,774 sq ft to 2,248 sq ft and are priced from Dh3.99 million ($1.08 million). The properties feature quality furnishings, parquet flooring, an Opus smart home system, LCD televisions, en-suite master bedrooms with king-size beds, en-suite second bedrooms with twin beds, walk-in wardrobes, fully equipped kitchens, spacious balconies with views overlooking the Arabian Gulf, Atlantis, the Burj Al Arab and the Palm, and extended terrace space. 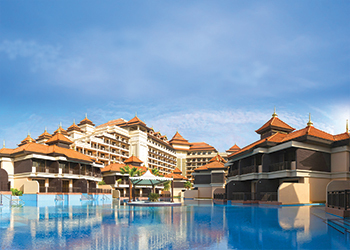 Facilities include a choice of seven restaurants in the resort, access to the Anantara spa, shared leisure facilities such as a gymnasium, temperature-controlled swimming pools, tennis courts, and kids’ club, plus housekeeping, in-room dining, laundry service and childcare.